Harry and Ena Widjojo with daughters Maylia (left) and Diana at Hardena. The cellphones of the Widjojo family lit up on the morning of Feb. 18. The James Beard Foundation had announced its list of semifinalists for its best chef award for the Mid-Atlantic states. 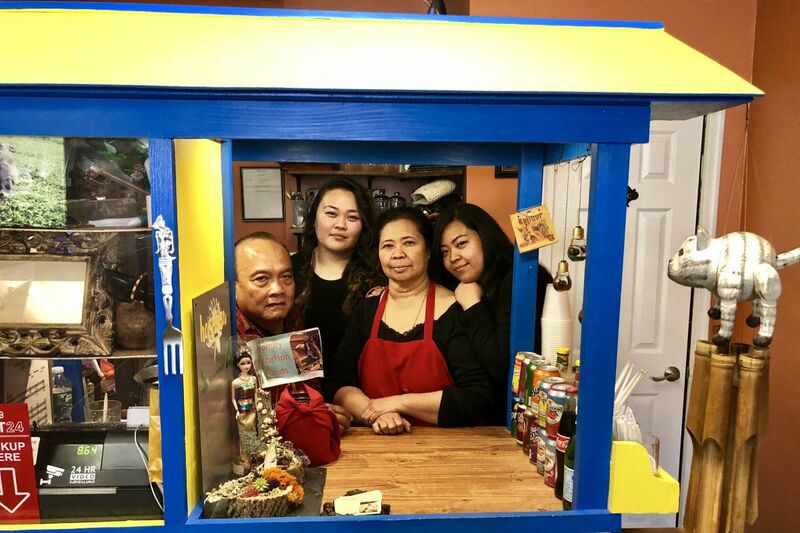 The names of Ena Widjojo and her daughters Maylia and Diana, who run Hardena, the humble Indonesian restaurant on a South Philadelphia corner, were on it, along with such names as Rich Landau from Vedge and Nicholas Elmi of Laurel. Their first reaction, as Diana Widjojo explained, was indifference: "We didn't know what this was." After some explanation, the feeling morphed into incredulity. And then to a modest satisfaction and pride. The feeling didn't vanish when they learned two weeks ago that they would not move on as finalists. Ena and her daughters, with husband Harry, sat with me between the lunch and dinner rush last week to tell their story. Ena Widjojo, in her mid-60s, has been cooking all her life. She went professional in 1977 and opened Hardena 18 years ago at Eighth and Jackson Streets in South Philadelphia, putting out a complex melting pot of Indian, Chinese, Arab, Portuguese, Spanish, English, and Dutch cuisines. In 2001, she moved Hardena to the corner of Hicks and Moore Streets (near 15th Street). For most of the time, Ena was in Philadelphia operating the restaurant while her husband and daughters lived in New York. As Ena edged toward retirement, Maylia moved to Philadelphia to go to culinary school. Diana studied at the Art Institute of New York with their sister Stephanie, who is not in the business. Diana also was a line cook at Noord. Now, Ena stops in to keep the kitchen in line, but it's Maylia and Diana's restaurant. "It was my mom's dream to hand it down to us so that we could take care of it," Diana says. Beef rendang, a beef curry, at Hardena. Were you always a good cook growing up? Ena: My mom is a culinary teacher in Indonesia. I don't like the cooking, but I like making cake. Then I started cooking. Maylia: Say what you would do after school. You would sell kue kue. Ena: My mom would teach me how to make a thousand-layer cake. She gave me 300 eggs to make 30 cakes in a charcoal oven. I have to make it look perfect every single time, or my mom would say, 'Oh, this is no good. Throw this away. This is not right.' If it is wrong, and then I had to destroy it. Like me, with my kids' cooking, if you're not good, that's no good. OK. Who’s the better chef, Maylia or Diana? Maylia and Diana: Oh, no. Diana: I have a different role here. I'm more the creative and financial piece. Ena: Bit by bit, a little bit. You're learning. Maylia: Our other sister is the best one. Ena, how did you get started as a professional chef? Ena: In the Indonesian Consulate in New York. They have a cantina downstairs, so all the people that work there would come down and have lunch. I cooked for all the diplomats, the president [at the time, Suharto], Henry Kissinger. How did you get to Philadelphia? Diana: My mom had friends here, and they invited her to Philadelphia to see if she could open up a place. They had an open house at their house, so she cooked a bunch of food, and it was basically free for the Indonesian community. And she invited everyone, and everyone came, and it was a unanimous, 'Yes, open it here.' There were about 10,000 Indonesians in Philadelphia back then. Since the recession [in 2008], about half went back home because they couldn't find jobs. If the local Indonesian population dropped, how do you stay open? Diana: Our customer base has basically done a 180. Now it's more Americans that come in. Indonesians would be about 20 percent now. Maylia: On holidays, they all come. Ramadan, all the American holidays. Is the food about the same from the way you started? You’re not doing fusion here? Diana: We try to keep it traditional as much as we possibly can. Maylia: We have catered to a lot of vegans, though, during the past five, six years. Some recipes actually call for meat, but we omit that because we find a lot of our customers now are vegan or vegetarian, so we try to accommodate them, too. Do you ever think of doing something a little bit more modern? Diana: I think that would be our next place. Hopefully we can come up with the money. But yes. I want to open a spot for Indonesian-style brunch. One that has the Dutch influence. Let’s say someone comes in here for the first time. They’re American, they’ve never had Indonesian food — what would you recommend? Maylia: The beef rendang and the tempeh. Diana: Tempeh is a big vegetarian dish. What a lot of people don't know is that tempeh is originally from Indonesia. We have what we call Vegetarian Friday, because most of our vegetarian customers come in on Friday. How do you think the James Beard people found you? I have no idea. No idea. I mean, a lot of our customer base has come here because of word of mouth, so I'm guessing that was probably how we got noticed by them. Just people talk about us. We have never paid for advertising.